The Merry Hives of F-Hain | Guten Morgen Berlin! June 4, 2014 January 11, 2015 - Guten Morgen Berlin! Always hang up your bees to dry in a cool, well-ventilated area. In true ‘Berliner pensioner’ fashion, Sunday mornings have now become my regular gardening session; I like to wander down and potter about after breakfast while the young’uns are still in bed nursing their hangovers. There’s pretty much only one job to be done each week: weed eradication. Well, not so much eradication as a distressed flailing while they erupt all over the bed so vigorously you can practically hear it. Today I also thinned out the golden beetroot seedlings and replanted the extras – and then a little dangling thing caught my eye. A green crescent, glowing with the sunlight behind it. A perfect little mangetout peapod. My first ever Berlin harvest was coming in already. I yelped with joy and did a little dance and it was then that I realised I wasn’t alone in the garden as I had thought. Klaus (all names have been changed to protect the subjects’ identities) is a wiry guy with a thin ponytail, a straggly goatee and a pair of archetypally German round-framed sunglasses which he seems to wear at all times, often even indoors. He has always been one of my favourite as he sits quietly and thoughtfully in the meetings, occasionally making notes in a small fake-fur-covered notebook, while everyone else barks objections at each other, and every so often he will raise a pensive brow and say something like ‘Well now this isn’t getting us anywhere is it, and frankly I think we’ve exhausted this point on the agenda’. I like his style, in other words. Today he was in the garden, weeding his little patch, clad in a burlap fedora and a tweed blazer which matched his goatee. He straightened his back and gave me a serious glare. “I go now to look at ze bees?” he stated, gesturing that I should come along having clearly forgotten that I speak German. “Ja, sehr gerne! !” I replied. “Achso. Komm.” And off we went to the bee hut. There’s a neat little smoker pot which you pop a few bits of eggbox into with a lit match, and then you can pump the little bellows to calm the bees down. That was my job and it became pretty damn crucial once it was clear that Klaus was intending to substantially piss them right the hell off. 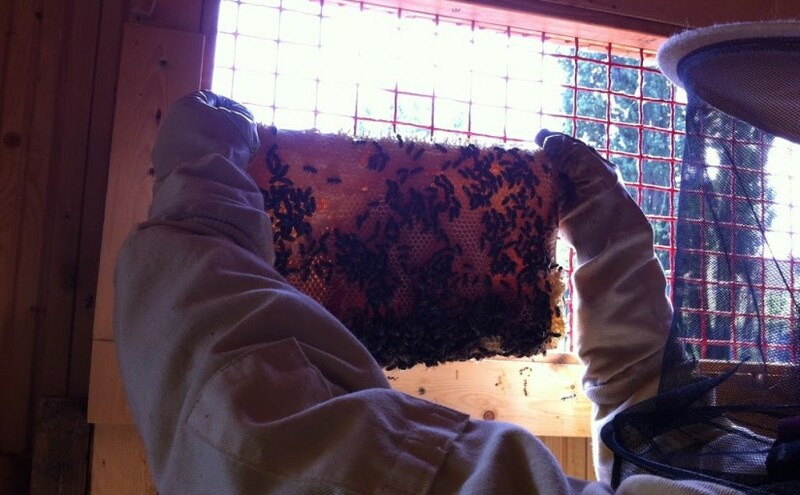 He took the lid off the hive and already they began to froth around on the top in a big brown mass. 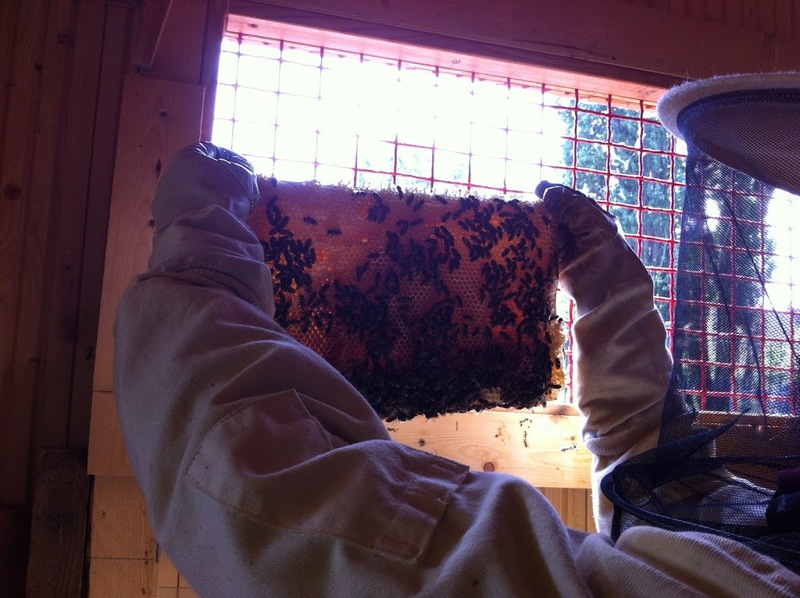 The hive is built into three layers, and the top layer is the ‘honey room’ (note: all my beekeeping terms are translated from half-understood German and thus may not be the standard technical nomenclature). Once you’ve calmed the bees down by puffing gusts of smoke into their face (yeah, that’d make me even more ticked off, I know) it’s time to check each frame in the hive to remove the ones that are completely full with honey. This is a pretty hard job in fact, because even though the little wooden frames of honeycomb look glowy and ethereal, they weigh a ton, because they are loaded with honey of course. Oh, and also because they are covered in bees. A good half-kilo of them milling about on the frame wondering what the hell you’re playing at. There’s a simple solution for removing the bees in order to harvest the comb, of course: smack it repeatedly and violently and then thwack the remaining bees off with a large brush. Let’s just say I had to pump those bellows like a madman. The next layer down is the colony itself, the space where the wax combs house little baby worms, soon to become more bees, rather than honey. When it’s empty the comb is fantastically geometric; it’s completely and utterly perfect in its hexagons and circles, and you’d think there was no way a living creature could naturally produce such uniform precision. When the cells are full, though, the bees build little roofs over them, and each different type of bee baby gets a different roof, so you can see immediately what kind of bee each cell wil produce: workers get a flat roof, drones get a blobular dome, and queens have a strange, tubular-round growth protruding about a centimetre out from the comb. Sometimes, the workers will build a queen-pod without a queen inside it, and there was one of these on the edge of one of the frames with its top open like a breakfast boiled egg. Klaus frowned and said, “Hmmm. That means something’s up.” He couldn’t elaborate further – evidently it’s one of those beekeeper’s instinct things – but apparently, the nearer you find one of those dummy queen cells to the centre of a frame, the worse of a sign it is. Again, what kind of bad juju it portends remained a mystery. So it was time to look in the bottom layer of the hive to see what was going on and ultimately, in true video-game fashion, to find the queen. I always hate the boss levels. By now the bees are really freakin furious and trying to get at my face; Klaus has a brief ‘oh my god bee in suit’ moment but after the panic dies down I suspect he just caught sight of his ponytail in the corner of his eye and mistook it. With bees everywhere and the other parts of their hive scattered around the room we start to pull out the frames in this bottom layer looking for the big mama, but she ain’t there. So it’s now time to put the hive back together. One of the most perplexing elements of the whole experience is how the bees, when not free-flying, behave more like a handful of lentils than a group of live insects. You can scoop them up and dump a wad of them on the table where they just go ‘ploop’ into a soft heap,, then sweep them into a dustpan and pour them back into the hive where they trickle in between the frames. Honestly, I reckon there’s a lot more interesting things you can do with this fascinating lot than just make them into a beard. Once you’ve built the hive back up, it’s time to check the others in exactly the same way, and finally, at the end of it all, it’s time to remove a glove, stick out a finger and dig it right into the golden oozy honeycomb. The fresh honey tastes so so sweet, a little herbal and is toothsome with tiny crumbles of wax. The honeycomb is one of the most beautiful things I’ve ever seen.